Jazz hipster / financier Rodney is throwing a one-year anniversary party for his bandleader friend Rex and his wife Delia. At the party is Johnnie, a deceitful band drummer with big plans to start his own band, recruit Rodney as his financier and Delia as his vocalist. As the party progresses, Johnnie starts to divide the friends with false insinuations of Delia's infidelity with Cass, the band manager. Lies and misunderstandings pile high until Rex loses his temper in a jealous rage. This film is a contemporary rewrite of Shakespeare's Othello, with dialogue updated to the beatnik and bebop slang. 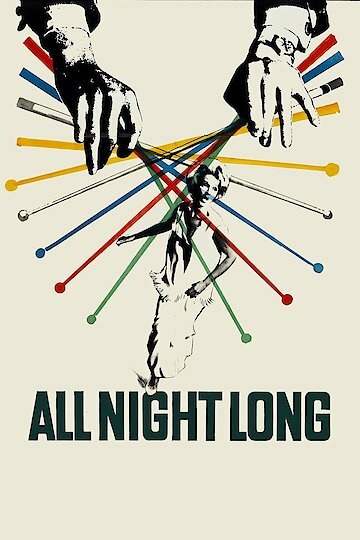 All Night Long is currently available to watch and stream, buy on demand at Amazon, iTunes online.